"Hi...You don't know me...but my name is Ajay..." I was reading this surprise mail in my in-box from this guy from the United States of America. He was seeking my advice on possible trek routes in the Himalayas. That's probably the first time I had a go at being a professional adviser on issues relating to trekking and guess what? it was the toughest I have handled so far! This guy was seeking almost the impossible! But neither could I refuse nor show incapability in the matter because of two reasons-One; He was the husband of my wife's dearest school buddy and Two; I myself wanted to find a solution to this interesting list of specifications. (I even have to think of putting together a team!). I spent quite some time handling the challenge of Ajay's two-sided specifications and did shoot off few options back, none of which were meeting the entire list of specs. Finally, after consulting with Chandan I recommended a traverse while also offering my companionship if he did not mind, praying fervently that the weather would hold good throughout the period. Apparently the trek promised to offer everything that was in Ajay's specs list- reason why I was so very keen to go personally. Thus began the preparations for one of the most beautiful treks I have done in Garhwal Mountains. Now I thank Ajay profusely in retrospective. Bamsaru-Khal defines,one of the routes from Yamunotri to Gangotri, along a traverse up the Hanumanganga river (one which confluences the Yamuna at Hanumanchatti), over across to Bamsarukhal and down from there along the Chayya Gidara Valley into the Bhagirathi valley opposite Gangnani hot springs; from where one can follow the Bhagirathi upriver till Gangotri. We were to take a slightly different route. We planned to trek up from Uttarkashi along the course of the Asigagnga river till Dodital and then climb over a steep mountainside to a place called Darwa Pass where we shall meet the Hanumanganga valley. From there our plan was to follow the Hanumanganga up-river till Bamsarukhal and then descend down into the Chayya Gidara bugyal and follow a ridge back into Dayara Bugyal. We would then descend further to meet the Bhagirathi valley at Bhatwari and from there back to Uttarkashi. Usually I am sceptical about doing a trek in the rainy season. My first brush with Himalayan rains was in August of '91 during the maiden trek to Pindari and a repeat of the experience in June '99 during our trek to Roopkund. I had vowed ever since that I shall always trek in end Spring or in Autumn. Volumes of readings on the great Himalayan adventures reinforced this opinion as well in due course of time. Rains can be painful while one is at the mercy of the elements in the lofty heights of Himalayas. Problems get compounded by tents and equipment getting heavier, vulnerability to blisters, lack of progress, excessive consumption of fuel to dry out cloths and socks, total eclipse of all the heavenly views and a general mood of depression and despondency that prevails in a camp which is waiting for a rain or a storm to subside. Add to this the gusts of local winds that make the nights so very noisy and dreary. However, the one thing that one gets to see only during rains is the riot of colours on the mountainsides and on the alpine meadows. One has to be extremely lucky to have a weather window in the midst of rainy season when the skies are cloud-free, yet the rainbow of colours of the rains would be decorating the colourful canvass of the mountain greens. We were gunning for one such trek. As usual our preparations started well in advance with mails being transacted every week on the progress made in physical fitness. Ajay, whom I had never seen in my life, seemed to be in good mettle – from whatever I read in the mails. Upon my request he ended shopping quite a bit of trekking equipment and maps which I knew could be procured only from the US. I really treasure the ice-axe and the Lehman maps he got...my companions in most treks till date. He was particularly apprehensive about the quality of drinking water and got a "Filter Bottle" which we found later to be quite a useful gizmo. It's a pity he took it back with him! All you had to do was, pour in some relatively clean looking water and then sip it back through a pipe which was fitted to a contraption inside the bottle. Enter- Krishnan- the third character ...almost one month before the trek was to start. He used to work with one of our clients and was bubbling with enthusiasm about the whole idea of experiencing a Himalayas. I obviously had saturated his consciousness with myriad tales of my previous treks over innumerable whiskeys in the local clubhouse at Barnala- Punjab. The team had initial conversations over e-mail only to discover, how diverse a group we were! The tall Punjabi from US, me the diminutive Oriya and Krishna(Short name for Krishnan)- the Tamil from Punjab did not sound exactly homogenous. But then that was the thrill of it all! The night before the designated day of start, both Ajay and Krishnan arrived and stayed for a sleep-over since we had to start early at 0400 Hrs. The deal for support services was already contracted with Chandan and all we had to do was reach Uttarkashi by lunchtime. Those days, the route was still through Dobata ; The Tehri Reservoir had still not formed. We reached Uttarkashi GMVN exactly at 1300 Hrs, Chandan and team waiting there with steaming hot lunch ready for us. Rana was going to be our guide and the deputy guide would be Jaisingh, who was the only one who had traversed the Bamsarukhal earlier; both of theme assisted by the NIM trained stout young lad Vinod. (One of the tributaries to Bhagirathi that confluences at Uttarkashi). After crossing the Asiganga Bridge which is almost the last point of the Uttarkashi town, on the journey towards Gangotri, the road to Sangamchatti is indicated by a sharp turn going upwards towards left off the highway to Gangotri almost 100 meters after crossing the Asiganga Bridge. With the cool August air caressing our faces we were eagerly discussing the way ahead when a fallen boulder from the hillside stopped our progress. We were still 10 Kms away from Sangamchatti. We decided to stretch our drive-weary limbs and started off on the hike right there. Shortly the Jeep caught up with us only to be stopped 5 Kms later because of another broken patch on the road. Suffice it to say that, our actual trek began at least 4 Kms before reaching our originally designated start point. The little hamlet was wearing a deserted look for some reason although it was only the first week of August! Anyways, the trail soon started its gradual accent upwards and after about an hour of toil we were pretty much high up, Sangamchatti and its connecting road appearing ever smaller at a distance. As I have described earlier, fresh showers in the mountains can add a different dimension to the ambience. The sky would be laden with light clouds, the occasional birds chirping, the air heavy yet cool on one's face, the sounds of the drops of water dripping down the leaves, the wide verdant valley kissed randomly by wisps of clouds and the faint thunder of some waterfall at the distance- evoke only a feeling of bliss... just the ecstatic joy of being in the midst of everything so pretty... the occasional light drizzle adding the extra dash of romance. Krishna was orgasmic ..to say the least! It was his first travel up the mountains to his career highest altitude of 2000 mtrs and with each step he was breaking his own altitude record! He probably was also happy because the real experience was much easier than what we all had prepared for, in terms of physical exertion. Krishna would constantly be talking to anyone near him and our guide Rana would forever be patient in answering his queries or nodding his head in agreement, since he would normally be the one in earshot. Ajay had decided to carry his rucksack while I had chosen against it. I wanted to ease into the grind. The gentle and gradual trail soon brought us to the little village called Agoda and the sun had still not set. Upon my frequent and persistent enquiry about the possibility of a non-vegetarian dinner, Rana vanished into the village to procure some chicken. Krishnan by that time, was bitterly complaining about his hurting finger and some accidental brush he had with some poisonous leaves resulting in some skin irritation. The trail was to lead us on further another 3 Kms to our camping spot for the night. I was lost in the beauty of the camp which was located right on the bank of the rivulet across a little bridge. This is a tributary of the Asiganga and is known for the sites it offers for game fishing. This night, we were going to have a proper roof over the head, in that unmanned 2 room rest-shed. There was a little structure of a Dhaba which was again unmanned- probably because of the scarce flow of tourists during this weather window, I thought. All the pleasant thought gave way to horror when I discovered this large spot of bleeding in my socks. Very soon we discovered that the wet earth outside was teeming with hungry leeches who would latch on to anything that's living and moving. Leeches are usually not dangerous unless a team of them settle down to feed on you, but the very issue of dealing with all that blood and gore is quite disturbing. I was having nightmares throughout the night thinking about possibilities of one of them latching on to the ears or any other bodily orifice!! I had earlier thought of using the open fields for morning ablutions, but the thought of leech attack on the backside now tormented me. We actually prepared a strategy to do the morning chores leech-free, identifying specific rocks and rock-beds and avoiding grassy wetland. In a single day we had travelled from the bustle of the city traffic to this tranquil little cocoon of a place...400 Kms of arduous drive and about 15 Kms of gentle trek. Of course, everything coming out of the camp kitchen tasted delicious including the Bhindi and the Baingan, not to speak of the chicken which didn't suit Ajay's strictly vegetarian palette. The team was bonding well together. Ajay and Krishnan were already into pulling each other's leg. With eager anticipation for the next day's trek which promised of Leech adventure, we went off to deep slumber. Finishing the morning chores wasn't as difficult as we had anticipated it to be. We were ready to go after the tasty breakfast that Pradeep always manages to pull off even in most difficult situations. Rana was giving us expert instructions on treading through Leech-land. Leeches are difficult customers...they would usually wait to strike...poi sed strategically on the little rocks and twigs lying on the trail..And almost leap several inches through the air to stick onto any exposed skin or shoes of the unsuspecting walker. They then slide and make their way through to any little surface of exposed skin and get started on their vampirish act. The art of handling this challenge is all about being watchful of where one treads next, avoid wet and dirty patches, cover up the shoes, socks and the lowers tightly with polythenes, applying copious amount of salt on all possible areas of attack and carrying some extra salt for emergency. After about an hour of this ordeal we finally gained some altitude which acted as a natural defence against this irritating menace. Presently the track winded through and rose over the thick foliage onto a roofed platform of a rest she d. The view around was amazing! We were essentially on the eastern slope of a massive ridge-line flanking a valley below and a serpentine river winding through at the bottom of it. The other side of the valley was a dark green slope with few waterfalls describing a silvery necklace through them. We were exhausted ...barely reaching 2700 mtrs at that point. Soon the entire gang assembled and we trudged forth to the lunch stop a few Kilometres away. The trail eased out after this as we started trekking level with the ridge line and made good progress till our lunch stop. "Saab koi medicine hai kya?" "Humare ek bujurg bhaisaab ko chot lagi hai ...ghav sukh nahin raha hai"..up there an injury that gets septic, without proper medical attention, can sometimes be fatal! "Zara unko bulayenge? Hum dekhna chahenge"...I wasn't willing to dole away drugs without applying my rudimentary medical knowledge. An aged gentleman materialised from a hut nearby, not too long after. He had an u gly wound on his sheen bandaged tightly, probably the result of some misdirected axe while cutting wood. I examined the wound and asked him to open the bandage only to witness the festering infection. I went busy for the next 15 minutes cleaning up the wound and applying Betadiene and Nebasulf and a plaster bandage to arrest the infection, his doting wife constantly supervising our actions with anxious attention. The man was extremely impressed and thankful for this simple act. We left the spot after sharing with him a few pills of Tylenol and abundant supply of antibiotic powder, for maintenance treatment. The old man insisted on taking home few extra pills of Tylenol that his wife could use for her persistent headache. (Ajay had procured this little bottle of Tylenol tablets from Seattle which I was distributing away liberally) I went into a bout of thought and introspection about the huge disparity in facilities available to o ur citizens...for even such basic things as Primary health. After another round of photo-shoot at that pretty little settlement it was time to move on. We still had about 8 Kilometres to cover and it was already 1300 hrs. The trail was gently undulating and the sky lightly overcast making it an easy go for next couple of hours. The sounds of a fast flowing stream raised hopes in our hearts; Was it Dodital? We were tired of the long trekking we had been doing for about six hours now. The high spirits were severely compromised when we finally came across this rivulet which looked impossible to cross without getting wet. Rana crossed over first and started commanding the crossing of each one of us. One by one we would take off our shoes, hold them aloft over the head and cross the rivulet, the feet going red in that bone-chilling water. Krishnan had the shock of his life during this experience and took about 20 minutes to recover circulation back to his dazed feet. About half an hour from there we came across a little temple of Bhairavji. A little inscription on the wall proclaimed that it was indeed renovated out of a donation by Mr and Mrs J J Irani of Jamshedpur, the famed CEO of Tata Steel. Ajay was explaining to us how his respect for the Parsi community got amplified manifold after this living example of generosity! After another few hundred meters the trail disappeared under a thick carpet of dried leaves as we were led onto a large flat land shaded under thick conifers. One could hear the melodious dangling bells of the cows grazing nearby. Another hundred meters saw us across a water stream which I later identified as the baby Asiganga and then onto a Dhaba beyond. Up ahead was the pretty emerald bowl of Dodital set amidst tall walls of high mountains surrounded with dark green pine forest on all sides. One forgot the day's tiredness for a few moments.. Completely absorbed in her divine beauty! The team started gathering around the little fire of the Dhaba over the next half an h our. All of us were eager to audit the Leech-borne damage to our feet. To our relief there wasn't much casualty on that count, our preparation had paid off. Krishnan was ecstatic about the day's achievement. The total trek of about 30 Kms was the longest and reaching 10000 ft, another first for him. Ajay would tease him gently with some light banter and the affable fellow that Krishnan is, would reply back in his inimitable Hindi in Tamil accent. After some tea and the refreshing warmth of the fire we set off to explore the emerald jewel of a lake, the source of Asiganga. There is a little log bridge over the baby Asiganga almost near its point of origin. The path leads onto a temple to one's left. On to the right, one can see the few h uts of the forest department that are used as tourist rest sheds. There are few concrete structures as well which probably had a similar purpose. The Chowkidar from Forest Department (who also doubled up as the local law enforcer) and the Pujari of the temple were the only people that stayed at the place for the better part of the year. The lake teemed with fishes of various sizes, occasionally carrying out the dolphinisque act of springing forth several feet over the surface of water. "Most of them are Mahseers, but you also find some Trouts"..Said the Chowkidar Mr Bhatt.."Lekin Saab Macchli Pakadna mana hai"..he explained further. That was the law to be enforced by him. One needed an angling permit from Uttarkashi in order to do angling here at Dodital. We dumped our loads by the campsite that was being set up and readied for us. Having extracted a promise of a campfire from Rana, we set off to explore the temple. The temple is set almost opposite to the camp side on the other side of the lake. Legend has it that this is the place the very concept of "Ganesha" was born. This is the place where Goddess Parvati gave shape to her dream child who eventually was born here. This is also the place where he guarded his meditating mother zealously and crossed path with his Mahayogi- father, Lord Shiva. The angry Shiva, upon being denied entry by this young upstart decided to teach him a lesson and swiftly cut his head. The Goddess was heartbroken when she heard of this and narrated the whole story. A repentant Lord Shiva then fixed the head of a wise animal – the elephant since that was the first living being one got which met the specifications laid down by the Lord. Thus started the legend of Ganesha- The wise elephant god. For the believers of the cult of Ganesha, this is one sacred place. We explored the totally deserted temple and then kept lazing on the small cosy veranda outside discussing the day's events. Krishnan was spirited and excited about his list of achievements. We tried our luck for procuring an angling rod from either of the residents but no such luck! We were so very desperate for some non-vegetarian food that we tried hunting some fairly large looking fishes by throwing stones into the water. Of course it was sheer absurdity! Later in the evening we did have a sumptuous vegetarian dinner sitting around the camp fire, listening to dramatic stories of bear attack narrated by Rana. The days toil took its toll as we drifted off to some heavy sleep. A clear sky and the shimmering waters of Dodital ushered in the next morning. The sounds of gentle flow of water, chirping birds and crickets added to the smell of the lake , mountain flowers and wet earth created an ambience that was serene, calm and invigorating. There are moments in that tranquillity one gets lost within oneself even while brushing teeth by the lakeside...just watching the playful swim of schools of fishes underwater. Before long, breakfast was over and we were setting off for the toughest task of the day...reaching Darwa Top. Earlier, an excited Krishnan rushed back from the kitchen announcing that there was Dosa on the menu. He was utterly disappointed when I clarified to him after enquiry that it was indeed Pancake and not Dosa. Darwa Top is the summit point of the massive wall of a mountain that guards the Northern Flank of the Dodital lake. The trail that leads on further from the camp area towards the Northeast leads you across a stream that feeds into the Dodital bringing in rain waters from the mountains above. This is where Ajay suffered a nasty fall into the waters while negotiating the slippery footholds, rich with a cover of algae. Fifteen minutes into the trek that morning his trekking attire was half wet with that chilling cold water. He was however in the best of his sporting self. From there on one crosses the stream again to take the true right bank for another 200 odd meters after which one has to cross back again to take the true left bank. Within 45 minutes of starting the trek one had done three crossings of the same stream. It's but obvious that our feet were red-cold with the little adventures and the better part of that one hour spent in tying and untying our shoe laces. After this, we were on a steep trail upwards and towards the left. The landscape and the flora were changing every moment now. Thick rich grass, shrubs laden with flowers and conifers and rhododendrons at a distance-it was the beginning of the trail to paradise. There are no defined paths here, at least not in the middle of monsoons. So one had to proceed in the genera l direction of what Jaisingh pointed out as the Darwa top. After some strenuous climb of another few hundred meters we came to a heap of rocks that served as a resting place where Rana produced some refreshing orange drink from the flask. Amidst friendly banters and leg-pulling we resumed the climb till the top. In all, we took about 4 hours to climb the 900 vertical meters to the Darwa top. There, at the top of the pass, the scene was ethereal. A zillion flowers created a riot of colours on that thick carpet of grass, clouds all around and below in the two valleys on both sides of the pa ss and the absolute quite filled with some gentle yet hearty whistling tune by Ajay – I still remember that scene as vividly as if it happened yesterday. As we faced ahead, the Dodital valley was to our right and the Hanumanganga valley to our left, both landmarks made obscure by low hanging clouds down in the valley. Jaisingh pointed out that we have still not reached the top which was still few hundred meters ahead and at least a hundred meters up, marked by a cairn. From here on, only one man knew the way ahead till Dayara Bugyal .. a good 35 Kilom eters ahead; Jaisingh. According to him, we were a bit behind schedule as it was already 1300 Hrs and we still had another ten Kilometres of ridge-walk ahead of us which would take us to our campsite at Bingad. After a brief stop for lunch which we all needed badly to recoup our strength, we set off to complete the day's itinerary. During this stretch I reflec ted and realised, how faithfully Chandan had stuck to the specification of a "Solitary Trek" while designing the itinerary. For the next three hours and ten Kilometres we did not find a single soul in that eerie atmosphere except for a lone Bakkarwal hut down in the Hanumanganga valley. Throughout that duration, all of us were lost in our own little world of thoughts. Krishnan was constantly ranting about the stiff challenge while Ajay would whistle on. I was busy conferring with Jaisingh about the route ahead and all around us was that thinly hanging mist. 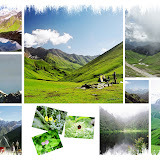 Occasionally the twin landmarks of Dodital and Hanumanganga on either sides of the ridge would peek out of the clouds hanging over them and the uninterrupted riots of colours on the meadow continued to provide company. The silence would sometimes be punctuated by the bark of some Bhutia dog making us aware of the presence of some Bakkarwals around somewhere. The trek was gentle, almost on top of the ridgeline, so it involved no strenuous climbing, just the even, unending trudge! "Saab, abhi hum karib 18 Kms trek kar cuke hain Dodital se"
"So what? Age kitna dur aur hai?" I asked "Why is he telling me this? "- I thought to myself. "Sir, 4 Kms aur hai..valley ka niche pahunchna hoga..us nadi ke kinare"- Jaisingh informed me. "Lekin Sir Porter log gussa kar rahe hain. Load jyada hai aur yeh log tired ho gaye hain sir"..Apparently the porters have been grumbling for last one hour and making their dissatisfaction known to Jaisingh. They thought, Jaisingh was to blame for he was the only one showing the way and they weren't quite confident if he was indeed efficient in charting out the route. "To kya karna chahiye aap ke hisab se? "...I threw the ball back in his court like a true consultant. "Abhi agar hum inhen kahenge ki char kilometre aur jana hai, to yeh log gussa ho jayenge. Mausam bhi to saath nahin de raha hai na sir? "...Jaisingh would still not directly recommend his thoughts. "Yehin camp kar len? Koi jagah dekho aur camp laga lo. Kal ek ghanta jyada trek kar lenge..thoda ja ldi nikal lenge"..I picked up the gauntlet and made the decision. Jaisingh lapped it up hungrily as if he was waiting for me to say just this. Immediately he started barking out orders for camping. In about 5 minutes time he had located a suitable camping spot by the side of a Bakkarwal's hut. "Jaisingh!" I called him aside again.."Pata karo agar mutton milega bakkarwal ke paas? Aaj humare taraf se sabko mutton khilao!" I thought, a celebration dinner was the best way to quench out any remaining disgruntlement amongst the porters. In that drizzling rain, Jaisingh set about the task of setting up the camps first. The place wasn't exactly a usual campsite for we were on a slope. Jaisingh spent considerable time with another porter, wielding the ice-axe to level out some land for pitching the tents. Slowly the entire team gathered and the campsite started teeming with the usual evening activity. Jaisingh and Rana went busy shopping for mutton and spent the better part of an hour haggling with the poor Bakkarwal for what they considered as the premium the fellow was charging. The premium in question was of course a paltry sum of 100 Rupees. I had to intervene to end the high-altitude-bargain-hunting on part of our colleagues and the Bakkarwal looked visibly relieved. I was surprised with the alacrity and efficiency displayed by some of the Nepali porters in the art of butchery and dressing the mutton. The whole affair just took them an hour and they emerged from somewhere in the valley below with several kilos of freshly dressed and washed mutton. Pradeep took charge after that and laid out a rich and sumptuous dinner in the next couple of hours. The light drizzle was relentless and we longed dearly for that much needed sleep. We already had reached over 4000 meters altitude ever since hitting Darwa Top; but the acclimatisation wasn't probably complete in spite of the several days of walking for I tossed and turned throughout the night. Next morning, as the tent walls lighted up with the first kiss of morning twilight I zipped open the tent and was spellbound for the next few minutes. The clouds that hung heavy in the valley in front the previous evening were clearing gradually, providing the first glimpse of the majestic vista of the Banderpunch massif. We never realised earlier that we were on the front seats of an amphitheatre, the centre stage of which was grandly dominated by this massive snow clad range. The wee hours of the morning were spent shooting photographs of the magnificent valley that presented itself right in front of us. Beyond the valley, three hanging glaciers were visible almost placed equidistant and symmetrically across the length of the entire massif. The sun shone brightly on top of the ridge behind the camp where few horses were seen grazing. Soon it was time for breakfast and the trek forward. I still treasure the picture of that breakfast table set behind our camp overlooking the colourful view of the valley beyond...on the sloping hill side we were seated as if in a huge open-air opera house. We were to tre k sharply downhill all the way till the river which gurgled playfully at the bottom of the valley. Jaisingh was leading the way followed closely by me on a route that wasn't exactly defined. The entire team was making a beeline from the horizon above. Shortly thereafter we regrouped by the riverside which had thick growth of bushes and four feet tall grass dotted variously with colourful flowers. There wasn't a track visible! "Jaisingh, yahan to koi route dikh nahin raha? Kahan se jana hai humen?" I was anxious about the integrity of the way, for if we get lost here, we would have to cover all those kilometres back to safety. "Koi baat nahin Sir...bas sidha age chalna hai"- he replied..Quite nonchalantly.
" Lekin Jaisingh..yahan to koi route hi nahin hai? "- I wasn't satisfied yet. "Koi baat nahin Sir, route bana lenge. Koi dikkat nahin hai. Aap preshan mat hoiye"...he was as confident as ever quietly going about his task of breaking branches and bushes to make way for the team that was coming behind us. He was literally cutting a path for the team through an over grown meadow with no sign of a visible trail. I finally surrendered to his confident air and started following him without losing any more breath. The route was now cutting across the river and back involving some pretty tricky stretches of climb over slippery earth and rubble, the river roaring few feet beneath. For some reason, the porter team was still cursing Jaisingh, not entirely confident of the necessity of the ordeal they were going through. Poor Jaisingh would only shrug and declare that this is the only route to Bamsarukhal...its only later that we realised that he was doing his best to find the most efficient route through that virgin terrain...one that minimised the stress on the load carriers. The view around was heavenly as usual, but we had no time, patience or spirit to partake of that bounty. Soon it was lunchtime but the destination remained over across the horizon to the right. We had to wait for about an hour there for the entire team to regroup and as soon as the reunion happened, the semi frozen lunch was finished in a matter of seconds. Before starting off again, Jaisingh let the group know of his apprehension about availability of a water source near the camp site. It was decided that whoever was the advance party to reach there at the top had to spend some time exploring the area to find water. The route ahead was in the 2 O clock directions into the nook of a high valley up above merging into the ridgeline defined by a tall wall of mountains. It was clear that the pass was somewhere along that ridgeline that was blocking our way directly. The ascent was steep...rising approximately another few hundred meters. That way we would camp this night just a few hundred meters, probably 200 meters, above the altitude of last night's camp, I estimated. Another hour was spent, negotiating that steep way up. I was making steady speed and ahead of the rest, closely following Jaisingh. Soon thereafter the terrain levelled out and Jaisingh marked a place, dumping his rucksack there. "Saab..aap zara paani ka khoj karo"...he directed me ahead and up in a direction further right.."Main baki logon ko yahan lata hoon"..he was apprehensive that some team members might lose the way since a white out was beginning to threaten us up there. "Zyada door mat jana...yeh rucksack ko nazar me rakhna"..he instructed me further. After some solitary adventure in that thickening white-out I finally found a place where there was a glacial tarn from which a small stream flowed. The exploration was scary to say the least since I knew the dangers of a white-out in an unknown terrain. The unaware and un-alert can run into fatal consequences since a whiteout renders you almost blind even in the brightness of daytime. I began shouting out to the team that I found water....after half an hour of incessant calling in that chilly white-out, I finally could attract attention and the team soon grouped there and started setting up the camp...at Bamsarukhal base. Bamsarukhal was yet not visible, but Jaisingh promised us a view of it the next morning as soon as the skies cleared. The white-out soon gave way to rains and the evening remained gloomy and drab, with all of us incarcerated in our respective tents. Krishnan braved the rains to roll about the remains of a glacier even in that drizzle...it was his first brush with snow. After some uneventful dinner we went off to sleep, preparing our minds for the final push ahead to the summit the next day. For some days now, we were seeing this distinct pattern of the weather. The mornings would be absolutely clear, making the surroundings breathtakingly beautiful. Come afternoon, clouds, mists, white outs, hail storms, light drizzles and gale force wind would make the evenings challenging and gloomy. The summit day was no different. This meant that we needed to summit as soon as possible...say around 1100 Hrs and then proceed forth to the camp site on the other side so that we are nicely settled in by the time the afternoon disturbances hit us. "Bamsaru Kund", informed Jaisingh. Later I read up JB Fraser who narrates the lake as "Matri Tal". He was on this route during his maiden foray to Gangotri. From a vantage point, one can see the entire range of Banderpunch can be seen perfectly reflected on its still blue waters. There were large snow fields to be crossed but luckily the ice on them was hard enough not to deter our progress. Krishnan however would take ages to tear himself away from the magical whites whenever he entered a snow field. He was thrilled beyond expression and comprehension, seeing so much of ice and snow at one place. Later on, just before attempting the final stretch to the pass, both Ajay and I took our respective shirts off and shot ourselves in the camera. We were having a lot of fun together as a team. I t hink this was the most memorable aspect of this trek, the bon-homie and camaraderie amongst complete strangers, till then. After struggling through loose scree and boulders (a feature which dominates almost every pass in the Himalayas) in the final 50 meters, I summited at 1100, joined in shortly thereafter by Ajay and later Krishnan by 1120 Hrs. We all applauded Krishna as he scrambled up to the pass on all fours, panting heavily. An achievement indeed for a maiden trek! The team regrouped and a pooja was carried out by Vinod- our deputy guide while Jaisingh went on explaining to us the names of the peaks at the distant horizon far across the valley of Chhaya Gidara Bugyal. One could see the cloud-kissed outlines of Shrikanta, Drupad Ka Dunda, Jaonli and the Gangotri Sisters. This valley , that was due West across the Bamsaru pass was decidedly prettier than the one we had come from...somehow things were a bit brighter around here. I checked the altimeter and nudged Ajay. "By the way ..you are standing taller than Mt Rainier Mr Malhotra...!" I informed .."Supposedly that's the highest in the mainland of American continent- Alaska not included". I let the glory sink in..and Ajay was looking into the altimeter reading of 4700 Meters with child like curiosity. "And this is but one of those non-descript passes in the Himalayas" I added on for dramatic effect, just to e mphasize the grandeur of the mighty ranges. I think, I myself, was suitably impressed by the very fact even while I narrated this to a fascinated Ajay. The descent was easy and gradual as all of us picked up speed. We had to be careful about it at the same time because of the potential damage to the knee during a rapid descent. One could see another Bakkarwal at a distance, whose Bhutia dog came to us, probably seeking some food. Krishnan had not noticed the typical anti-leopard- spiked-metal-collar that these animals wear. I think he was adequately impressed with the ingenuity of the solution! The valley here was gently undulating, bells of the herds at the distance, landscape dotted with forests miles away. We could see a large herd of horses at a distance. They were randomly scattered across the entire valley of probably a visible-50 square Kilometres. We were soon to take a course right, about 4 kilometres after descent which would lead us to Gidara Bugyal and then on to Dayara Bugyal the next day. We could see a little stream flowing in from the extreme end of this valley to the right and Rana selected that to be the camping ground...near the source of that stream. We had our share of grass-glissading which rendered quite a few water-proofs in the team torn at the seam of buttocks. This was the most beautiful campsite ever. A small stream that was flowing silently, our tents on a little raised platform, overlooking the valley ahead to the North, the wild horses cavorting around playfully, some coming close to sniff for food in the camp, the absolute bright green all around, the lovely sky with wisps of cloud and somewhere across touching the skyline was the brown and white outline of Bamsarukhal pass. We spent that night constantly being aware of presence of horses, the sounds of their neighs and gallops!! Bugyal begins. It's such an absolute contrast of terrains; one is physically shocked out of senses. We did manage to crossover without incident, Jaisingh and Rana watching over our actions carefully. Once across this stretch one is onto a ridgeline which leads one straight onto Dayara Bugyal. It was 1 000 Hrs in the morning when we hit the ridgeline. We were on our homing trail and the team was happy and joyful. Amidst jokes, banters, name calling and whistling it felt as if we were on a picnic. For two hours we went on till we reached a spot where the ridge almost ended. Rana guided us back few meters to point us into another ridgeline that led onto right. I noticed that all along those ridges we had been generally taking right turns ever since we hit Agoda. Basically meaning thereby that from Agoda till Dayara we were describing a huge semi circle with the Dodital lake in the middle of it all. In another 2 hours we reached the pretty undulating meadows of Dayara Bugyal. What it lacked in terms of natural vista compared to Gidara, it made up easily for it by the sheer expanse of the area...this place was vast!! Miles and miles of undulating alpine meadow! The occasional cluster of tree line along the mountain sides only added to the beauty. 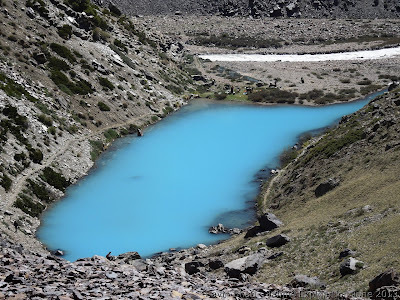 There was a small lake we noticed whose water did not look potable. That's when we realised that we were terribly thirsty. We were terribly thirsty and there was not a soul in sight. The lone Bakkarwal hut that was visible had two fierce looking Bhutia Dogs who would bare their fangs even as we passed by. To add to our woes, the Sun broke through the cloud cover and sucked away any vestiges of water from our body. The second pond that we saw from a distance was again a muddy brown and by now I was literally panicking. I rued my luck and cursed myself for not having been economical in consumption of water earlier during the day. That's when I caught up with Jaisingh who tried to pump up my spirits by some hopeful words. Pradeep was also there nearby. As we proceeded ahead up through shades of the tree we suddenly saw a clearing guarded by a little Gujjar hut. There was a lady in the house whom Pradeep and Jaisingh engaged in an animated conference. Apparently our problem had been resolved. And boy!! Was it resolved?! Pradeep pointed out to a little water spring about 50 feet away and also informed that fresh Butter milk was being readied for the team. The water was the coolest and sweetest I ever tasted; probably the effect was magnified after three hours of sunny walk with parched throat. The butter milk served in small glasses was the icing on the cake. "This is what nectar for the gods would have tasted like! "- I mused. After the entire team arrived, we had our lunch and left after an hour, profusely thanking the Gujjar lady for her warm hospitality. The planned site for camping was about 4 Kilometres further down which was a cake walk after all that invigorating replenishment of energy. We passed by a group of hutments, some of them claiming to be hotels. This was a human settlement indeed and was seeing increasing tourist activity over past couple of years, Rana informed us. We were to walk only a bit further to the camping ground. At about 1630 hours, after seven gruelling hours of trek over 18 Kilometres we reached a small field, east of which was the Kala-Nag Peak clearly visible. A little stream gurgled past a few meters away and the misty evening was rendered musical by several tinkling bells of the cows and buffaloes grazing nearby. I reached first with Jaisingh and was in a surreal trance just enjoying my existence in paradise. Soon the team arrived and the camp was set up. We helped the porters fetch some firewood from the nearby forest so that a camp fire could be setup. We warmed up our tired limbs over dinner and Rana-stories. It's always a sad departure from the laps of the Great Mountains. Today was no different; we were to start from Dayara at 0730 in the morning, targeting to reach Delhi by 2200 in the night. The trek downhill to Barsu was swift for the road winds steadily downhill through picturesque terrains. One needs to be sure of the path though because one sees a network of bridle paths at times that can be confusing for the uninitiated. The onward pick-up was already waiting when we assembled there. After some final photo-shoot and shaking of hands we rode on back to Uttarkashi. Ajay was happy that he would be indeed back in Delhi by 11th May because he had a connecting flight to catch. Krishnan was gloriously ecstatic about his maiden adventure...to all and sundry he would go on informing later that we actually did a 5000er summit. ..Haha! On a serious note, even 4700 for a maiden trek earned him tremendous respect by all in the team. Technically speaking he had just touched the boundaries of what's defined as "Very High Altitude" trekking– in the 15000 ft to 20000ft bracket. Ajay's specs list had finally been met..
We were cold at nights but never lower than -4, we reached taller than Mt Rainier but not too tall to have a sustained snow challenge, we had a nice mix of sunny clear skies in the morning and the romance of light drizzle and mist in the evenings. We had moments of anxiety and adventure yet all along had fun like a bunch of children. On top of everything else, we had the most amazing array of views that was ever changing - the dense evergreens of Sangamchatti, the wet and swampy leech land beyond Agoda, the ridge-walk around that rain drenched valley to Dodital, the pretty lake resort of Dodital with the abundant flora and aquatic fauna, the VoF-ish terrain en-route Darwa Top, the extended ridge walk from Darwa till Dayara at over 4000 meters for 4 days, the amphithe atre camp at Bingad, the high camp under hanging glaciers, the jewel of a lake at Bamsaru, the ice-snow-scree challenge across the pass, the verdant greens and wild horses of Gidara and finally the misty meadows with cow-bell melody at Dayara. Each day had been different and in some cases each hour! Not another tourist party did we see till we reached back at Uttarkashi. The few strangers that we met on the way had been all goat herds, miles away from where we were walking. The only ones that came close were the generally friendly Bhutia shepherd dogs. My Romance with the Dayara Valley had begun, Krishnan hooked to the mountains for his life and I had a new friend-the most affable Ajay. Parting gifts of the ever-generous Himalayas that one treasures for a lifetime! In other way, this is more than a travelogue ! Hats off to you, dear friend ! Since a few months back, I have been seriously considering to launch a titled blog journal for the Indian trekkers..I mean to include ( definitely on expressed willingness of the authors ) travelogues (surely literary travel writings too) in such journal with adequate tags and links so one can consult the archives for own planning...I could not float the idea for being much of work pressure..maybe, I shall have some recess to finalise the plan..
Again, thanks for sharing a brilliant piece of travelogue (that too relating to a really non-descript trail in the Himalayas ) with us, friend ! Have a great going in life.. It was an excellent feat, as the way I read it. Am myself planning to go on for a trek in late May 2008, through the organized route, in Himachal, as this would be my first one. While reaching office , this morning, wasn't feeling much like starting work ,and so I tried searching for fellow travelers/trekkers from Delhi who are going the same path, and voila, your is the first story to unfurl in front me. And boy, I am so glad it did. It must be the most fantastic anecdote I have ever read about one's journey. Your narration is definitely in the manner which urges readers to keep on reading further.I wish that some day you definitely would be able to publish your travel memoirs, and in fact that is what you are doing here right now, and I appreciate you for that. you are an avid trekkers. I wish you have lots of trip ahead and best of the times. Only an aspiring writer would ever feel what I feel when I read such generous words lavished upon me!! Your comments are works of art by themselves! I thank profusely from the bottom of my heart! He he...I was intrigued...Dickens, Hardy and Maugham in one clean sweep! ;-) So I tht let me examine the case carefully. 2. Loved the description of rains in the Himalayas at the beginning. 3. This blog stands out from the rest because of the diverse character sketches which come through so clearly- Ajay, Krishnan & you, and this is done with an economy of words. Makes a reader relate to the central players in this drama. Maybe you could have added similar introductions to Chandan/Jaisingh- not too many though. Overall- a delicious piece of prose. Let it flow...Cheers! I got particularly interested in this trek as I'm almost set to explore a small part of the north-eastern part of Garhwal. 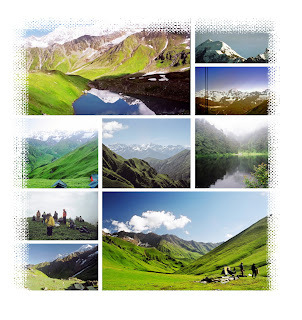 This post is a fantastic narration of the trek to Bamsarukhal. I presume this is in the north-western parts of Garhwal. And oh, your pictures are fabulous. May I use '24gidara' as my desktop please? Nice work.. We guys are in Shimla.. And an mountaineering enthusiast. Wish we can do something for you.. Sorry about this huge delay in replying...have seen the comments section for the first time after many months :-). Pardon me for that. Of course you can use that pic. You are welcome. hello sir, i just loved this article and the place you have been. i would definetly go there ASAP, The photographs are brilliant and with your permission i would like to share it on my facebook profile for freinds, nothing commercial at all. I hope i can get some tips on doing this trek from you, or best of all please let me know if you are planning to do it again or similar ones. I am saurabh(saurabh.svt@gmail.com) nature lover and photography enthusiast. That is a wonderful write-up of the beautiful trek. I am planning to do this trek exactly the opposite way. Starting from Dayara and returning back through Dodital- Agoda. Would be great if you could suggest if it is doable, although we anyway(a group of 4) are giving it a try next week. Can you provide any contact info of guides??? Jaisingh seems to be famous! and rates they charge. September end shd be a good time. The town of uttarkashi has enoughguides and porters to take u up till Darwa Top. There are few who have explored the Darwa- Bamsaru area. I always hire an agency who not only supply the required qualification of guides but also take responsibility of managing the porters. So I may not beof help to provide numbers of idividual porters or guides.